So remember the Lilith Fair? A monumental, epic, crunchy-granola, feel-good testament to all that is feminine? Good news if you do remember: You have great taste in female artists. Good news if you don’t remember: Amanda Mair can provide a cheat-sheet to all the Lilith Fair awesomeness you have been deprived of. Amanda Mair, first of all, is a baby (aka born 1994 – don’t think about it – it’ll only hurt your soul). The Swedish singer has a beautiful, clear, natural voice that neither grates nor wears on listeners. I could literally listen to her all day. More good news: her debut, self-titled album will be available June 5, 2012. Most of her music on the album is laid-back – easy listening but distinctive enough not to become boring. There are some poppy undertones (try “Doubt”) – as well as some richer (almost soulful?) sounds on tracks like “Sense.” My personal favorite is “Skinnarviksberget” which makes me think of every prince-and-princess-falling-in-love moment from all our favorite Disney movie classics. So: Feminists, Scandinavian-philes, Disney-lovers, children of the 90s, unite (if you don’t fall into one of those categories, you need to seriously reassess your interests)! Spread the word of Amanda Mair. She’s definitely worth a listen. Which is why I thought it was funny that Wainwright’s new Mark Ronson produced album “Out of the Game” was being hailed as a dance-pop record. It seemed incongruous. Having listened to it now though, I see it. Although most dance-pop albums don’t contain the lyrics “choking on my bitter tears/my bitter tears” this is dance-pop in the style of Rufus Wainwright. In other words, Rufus Wainwright doesn’t change for dance-pop, dance-pop changes for Rufus Wainwright. While the distinctive voice and the sweet melancholy remain in true Wainwright form, the backdrop for this work consists of upbeat drums, powerful bass and peppy horns as opposed to the minimalist keyboard or the slow orchestral march of his previous albums. Wainwright’s tracks). The album ends with the epic, seven minute long “Candles.” With any other artist I would say that closing your album with two minutes of bagpipes is self indulgent, but for Wainwright it works. I don’t know that listening to this album would have me out of my chair and dancing, but I do know that by the end of it I have a silly smile on my face and, contradictory as it may be, the same sense of satisfaction that comes from finishing a good book, albeit a somber one. All in all not a bad state of being. Wendy Versus. What a great name. It encompasses all the necessary aspects: attention-grabbing, memorable, and most importantly, intriguing. Wendy versus what? The world? An amorphous, spotted, toothy, aquamarine, crayon-styled monster? Judging by the cover art on this album I’d guess the latter, which is good because any piece of artwork that brings to mind “Harold and the Purple Crayon” has already won major points from me. Wendy Versus is a Toronto-based trio with a textured and unique sound. On their website, the band explains that lead singer, Wendy Leung, is a classically trained pianist with a “dark melancholic heart” and a love for electro-pop. I read this description after listening to the album and it made perfect sense. “Crayon Wars” (another great name – this band should hire out their services to other groups in need of solid titles) is full of ballad-style songs dominated by the rich, melodious voice of Leung. Her lovely vocal instrument is backed by the dream-pop haze created by Dean Marino on guitar and Owen Norquay on synth. This debut album is distinctive for its flexibility. 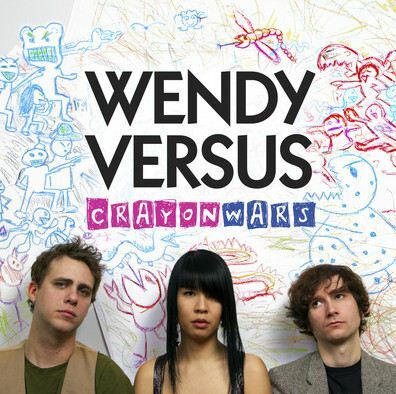 Far from one song merging into another with little distinction between poppy synth sounds mixed with soulful lyrics, Wendy Versus delivers a wide variety of sounds and stories on Crayon Wars. “White Noise” is a spare but upbeat tune, “Juliana” a darker, more complex story, “Open My Eyes” gives a brooding, almost angsty tone to the compilation. With 10 tracks on this disc, the band has really offered its listeners a substantial work they’re sure to enjoy.